Playapod to Revolutionize the Podcast Experience Across Android and iOS devices. TMSOFT announces the release of a new mobile application designed to simplify the lives of anybody and everybody who enjoys listening to Podcasts. 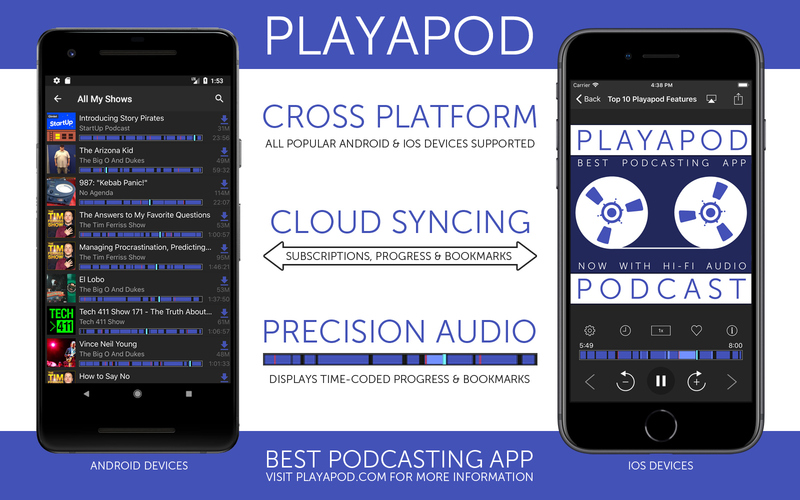 Available for both Android and iOS, Playapod is a new cross-platform mobile app that syncs podcasts to the cloud, allowing for immediate playback across all devices. Unlike their competitors in an already cluttered market, Playapod is the only podcast app that displays exactly what the user has listened to, skipped over and “favorited” across all podcast episodes. App features include cross-platform device syncing, episode progress down to the second, time-coded bookmarks, offline listening, easy-to- use interface and fast performance. The program is free of charge to download and Playapod will never disrupt original podcast content by displaying advertising or interrupting the playback with audio ads. second, time-coded bookmarks, offline listening, easy-to- use interface and fast performance. Discover Podcasts – Find new podcast shows by searching or browsing the Featured and Popular lists. Podcast subscriptions can be automatically downloaded so your device is always updated and ready to play great audio content. Multi-Device Sync – Sync podcast subscriptions and episode data between multiple devices across all platforms! Just sign-in using Email, Twitter, Facebook, or Google to enable device syncing. Precision Progress Bar – All podcast episodes displays exactly the portions that you have listened to, skipped over, and favorited down to the second. Never forget where you left off, what parts have been listened, or the favorite moments of each episode. All progress bar info is synced across your devices. Bookmarking – Save bookmarks of your favorite moments of each podcast episode so you can quickly go back and listen again. Bookmarks are time-coded and cloud synced across all your devices. Listen Offline – Download entire podcasts and listen on the go without a network connection or cellular data charges. Media Controls – Toggle playback and skip forward and backwards quickly using lock screen and Bluetooth controls. No Ads – No bulky 3rd party ad networks that kill battery life, slow performance, and consume network bandwidth. Free Download – Free to download from the Google Play Store, Apple App Store, and Amazon Appstore. Push Notifications – Receive new episode notifications delivered to your device and stay on top of your favorite shows. Import Podcasts – Quickly import a list of podcasts using OPML files. Advanced Configuration – Lots of settings to customize and tweak the behavior of the Playapod app. Officially launching today, Tuesday, February 6, Playapod is available via free download from the Google Play Store, Apple App Store, and Amazon Appstore. This entry was posted in Podcasting and tagged Android, iOS, mobile app, podcast, podcasting, podcasts, web. Bookmark the permalink.